WASHINGTON — In what was most likely a largely symbolic vote, 136 House Republicans joined with Democrats on Thursday in an overwhelming show of disapproval of the Trump administration’s policy toward three Kremlin-aligned companies. 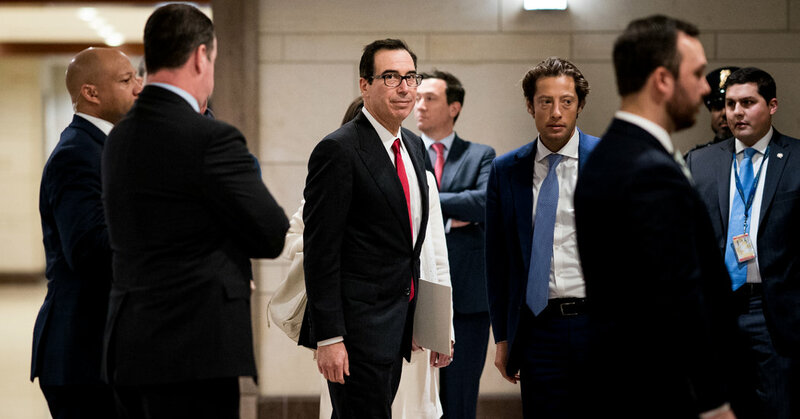 The House voted 362 to 53 to block the Treasury Department from lifting sanctions against the companies, which are controlled by the Russian oligarch Oleg V. Deripaska. Had a similar resolution also passed the Republican-controlled Senate, it would have blocked the Treasury Department’s move and led to the enforcement of the sanctions against the aluminum giant Rusal and two linked firms. But an effort by Senate Democrats failed on Wednesday to clear the 60-vote threshold required for passage, despite winning support from 11 Republicans. Thursday’s House vote, in which nearly 70 percent of House Republicans sided with Democrats and against the Trump administration, represented an even more dramatic display of Republican opposition to the move, signaling concerns within President Trump’s own party about his administration’s handling of a key aspect of its Russia policy. The congressional showdown over Russia sanctions comes at a time when Mr. Trump’s allies have increasingly struggled to address questions about the investigation by the special counsel, Robert S. Mueller III, into Russian interference in the 2016 election on behalf of Mr. Trump, and whether Mr. Trump’s team coordinated with the effort. Democrats had urged the administration to delay its decision on the fate of the sanctions until the conclusion of Mr. Mueller’s investigation. They noted that Mr. Deripaska had emerged as a bit character in the story lines around the investigation as a result of his relationship with Paul Manafort, Mr. Trump’s former campaign chairman. Mr. Manafort has been convicted of and pleaded guilty to charges brought by Mr. Mueller’s team. Last April the Treasury Department announced sanctions on Mr. Deripaska, his companies and those of other Russian oligarchs in retaliation for the Russian meddling, casting the penalties as evidence that the administration was taking a tough stance against Moscow. While the sanctions went into effect against Mr. Deripaska personally, the sanctions against three of his companies were repeatedly delayed amid an aggressive lobbying and legal campaign by his companies and their allies. They argued that the corporate sanctions would have unintended economic ripple effects that would damage companies in the United States, Europe, Jamaica, Guinea and elsewhere by disrupting the supply of aluminum. The Treasury Department announced last month that it had negotiated a deal with Mr. Deripaska’s companies to lift the sanctions in exchange for a reduction of his control and ownership. But Democrats argued that the deal failed to do that, and merely shifted ownership and control to proxies of Mr. Deripaska and the Kremlin, including Mr. Deripaska’s charitable foundation, his former wife and the Russian bank VTB, which has also been put under sanctions. Unless the Senate revisits the measure, the Treasury Department is expected to lift the sanctions this month. The department quietly extended the deadline for carrying out the sanctions late Wednesday night, in a move that was seen as providing more time for Mr. Deripaska to sell his shares of the companies. How has business been affected by Brexit so far? January 31, 2019 Comments Off on How has business been affected by Brexit so far?